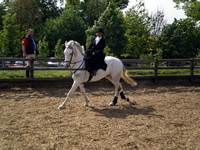 At Jill Carenza Equestrian (Cotswolds Riding) also incorporating The Vine Bed & Breakfast we are committed in respecting and protecting your details whether you are a visitor to our website or use other services we provide as a business. This policy explains what happens to personal data under the General Data Protection Regulation or (GDPR) that you provide, how we collect it, how it is used and how it is stored. We will not, however, send you any unsolicited marketing or spam and will take all reasonable steps to ensure that. We fully protect your rights and comply with our obligations under the GDPR. Our use of your personal data under GDPR will always have a lawful basis, either because it is necessary for our performance of a contract with you, because you have consented to our use of your personal data (e.g. by subscribing to emails), because it is in our legitimate interest to do so or because if necessary we are legally obliged to use or disclose information about you. Personal data is kept for as long but no longer than is necessary in light of the reason(s) for which it was first collected or for any period that might be required by law. When there is no further requirement to use, hold or store personal data we shall remove it from our records. Where you have opted to receive communication from us, we shall retain the details you have provided for so long as you remain an active subscriber (i.e. you have not unsubscribed). We will not provide your detail to other third parties except where required and with your consent to provide extra services associated with your booking. If you are concerned about our use of your personal data, please use the contact details provided at the end of this document and we will do our best to solve the problem for you. If we are unable to help, you have the right to lodge a complaint with the Information Commissioner’s Office. Users are advised to use social media platforms wisely and communicate / engage upon them with due care in regard to their own privacy and personal details Users wishing to disclose any personal or sensitive information through social media platforms are encouraged to discuss such matters through primary channels such as by telephone or email. Cookies provide information regarding the computer used by a visitor. We may gather information about your general internet use by using the cookies. Where used these cookies are downloaded to your computer and stored on the computer’s hard drive. Such information is not personally identifiable, it is purely statistical only.